If we ever want to colonize the moon or other planets like Mars, we will need to transport huge amounts of material and many colonists to space. Doing this with rockets is costly, inefficient and also dangerous. What if we could lift material and people into space just like an elevator? This is the concept of the Space Elevator. This article summarizes the concept of the Space Elevator and examines what would happen if we really built one. Whenever we want to fly into space, we need to leave Earth’s gravitational field first. We do this with rockets. They lift off by burning enormous amounts of rocket fuel, which produces a push against gravity. First slowly, then ever faster goes the rocket, up into the sky. The force of the rocket engines can be felt many miles aways. But yet, everything that remains of this shiny tower of metal when it reaches space is just the content of its tip, the payload. Be it a satellite, a capsule for the International Space Station or a space probe – it is just a fraction of the size of the rocket. The rest of the rocket is just fuel. This proportion of fuel to payload is what makes space flight so expensive. You have to pay for all that fuel. It is also very inefficient, because most fuel is needed to lift other fuel just a little bit higher. And it is also dangerous. Flying in a rocket essentially means sitting on top of tons of explosive material which is meant to burn under controlled conditions. But sometimes this process gets out of hand. Everybody remembers the pictures of rockets or even space shuttles exploding half way up to the starts. Such an explosion can be caused by a tiny spark inside the rocket. This risk also limits the kind of material that we can fly into space. To build a sophisticated space probe takes years and costs billions of dollars – but it can be lost in the blink of an eye. You would also not want a rocket that transports the fuel for nuclear power plants on Mars to explode over your head. All in all, using rockets sounds like a terrible way to go into space – but it is the only one that we have today. But what if we could go to space without burning any fuel? What if we could just climb a ladder, like Jack and the Beanstalk? This is the concept of the Space Elevator. It was first introduced by the Russian visionary and space pioneer Konstantin Tsiolkovsky. The concept has been discussed and refined by following generations of science fiction authors and scientists alike. The basic idea of the Space Elevator is to extend a structure from the surface of the Earth into space. Along this structure, a vehicle could move up and down, like an elevator cab. Hence the name Space Elevator. Figure 1. Concept of a Space Elevator. Released by Wikipedia users Skyway and Booyabazooka under the CC BY-SA 1.0 license. Tsiolkovsky first thought about building a tower into space. But such a tower would collapse under its own weight. Modern concepts for the Space Elevator include a cable instead, along which a vehicle called climber would move. This cable touches Earth on some point at the equator and reaches straight up into heaven. When the cable is so long that its center of mass is in a geostationary orbit, then the centrifugal forces will counter Earth gravity. This way, the cable will stay straight and upward all the time. The geostationary orbit is at almost 36,000km above Earth, and the cable needs to be even longer to put its center of mass into geostationary orbit. This extraordinary long cable would need to hold its own weight, and to date no material is known that could do it. Other open question include how to power the climber along the tens of thousands kilometers or how to bring the cable into space in the first place. If we could build such an elevator, the costs to transport material to space would drop dramatically, because no rocket fuel would be required any more. This also would make space travel much safer, as no explosive materials need to be taken along. With the Space Elevator, we could put a permament space station into geostationary orbit. From there on, we could service the satellites that circle Earth and collect the debris of decomissioned satellites, making space safer. This space station could also act as a space shipyard. It could assemble space ships and probes with parts provided by Earth. These ships could be much bigger than today’s spaceships, because they don’t need to be lifted with rocket any more. Bigger ships mean that they can take more fuel, allowing for longer travel and more manouvers. They could also carry all the material for grand scale colonization of other planets. A space ship that is constructed on this space station could leave Earth orbit simply by moving up the cable of the Space Elevator a little further. At a distance of about 53,000 kilometers, it reaches espace velocity and thus starts its journey into space using as little fuel as possible. The Space Elevator would allow to use the ressources that we might find in space. The asteroid field is supposed to be full of valuable ressources. If we could mine them, we would need the Space Elevator to bring them down to Earth. The technical challenges of building a Space Elevator cannot be solved with today’s technology. But given the speed of the technlological development, we might expect that they will be solved in the next couple of decades. But if they could, what would this mean politically? As mentioned above, the lower end of a Space Elevator has to be on the equator. This limits the possible locations of the space elevator to countries that are in South America, central Africa or some islands of Indonesia. These countries do not include any currently space-faring nation. This means any country that is likely to be able to build a Space Elevator has to negotiate with a country that is on the equator. This means that the countries along the equator have a supreme bargaining position. They will attract heavy infrastructure investment as the Space Elevator needs to be connected to the surface transporation network of Earth. But having this geographical advantage could also be a threat to these countries. After all, it would not be the first time that more powerful countries used their force to control critical infrastructure in other countries, as the USA did with the Panama Canal. Figure 2. 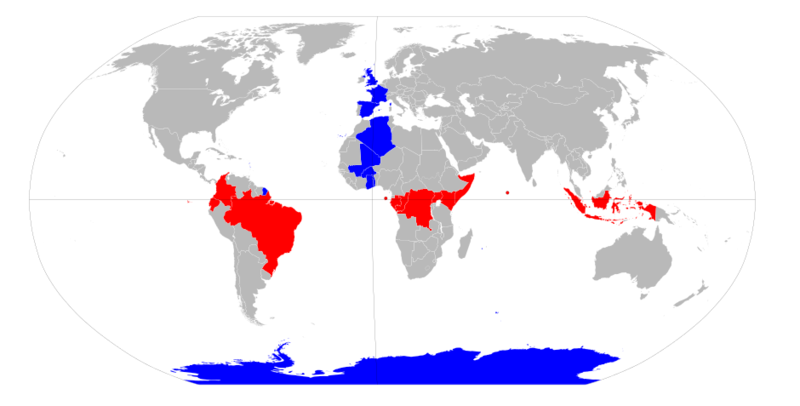 Countries along the equator (red). Released by Wikipedia user NuclearVacuum under the CC BY-SA 3.0 license. The first country to build a Space Elevator would enjoy a huge advantage in space exploration over all other countries. Given the complexity of building it and the limited amount of places where to build one, only a few or even one nation could build the elevator for themselves. All other countries could use the elevator only if the nation that controls it accepts the access. This fact could lead to different scenarios. Other nations could try to build elevators themselves, leading to another “space race”. Or they could enforce access to the existing elevator. They could enforce it with a simple threat: Share it, or we destroy it! It is not hard to hit a cable of 50,000km with a rocket but almost impossible to defend it. So the controlling nation must share the elevator with the others, guaranteeing the neutrality. If the space-faring nations realize that they cannot construct an elevator just for themselves, they might instead decide to cooperate. This way, the progress could be faster, as all participants will be working on technical challenges together. Raising the enormous amounts of capital required would also be easier in international cooperation. In this case, the exploration of space might bring about the first real form of international cooperation on a grand scale. The doors to space will only open for us if we find an efficient and safe way to leave Earth’s gravity behind us. Doing so is not only a huge technical challenge, but also a political one. How we handle this task might set the pattern for the future: Will we compete in this space race, eventually using force on smaller countries to gain an advantage? Or will we cooperate to make this dream reality? The answers to these questions might lie decades in the future, but thinking about them today might change our attitude towards today’s problems, too. So start giving these problems a thought today.